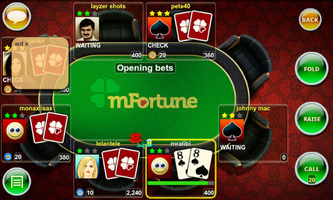 mFortune Texas Hold'em is unique in that is works on ANY type of handset that has an internet connection. That means you can play against any of your friends, regardless of whether they use a Nokia, Blackberry, Android, Windows Phone or iOS phone or tablet. The only app to work on ANY type of phone or tablet. 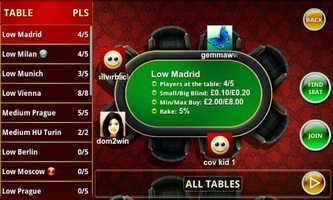 Play Texas Hold'em cash games on your iPad. Try the app and get £5 totally free when you sign-up. Option to create private tables and invite your friends. Large casino player base means plenty of poker fish. The mFortune brand may not be one you are too familiar with and this is because they are one of the younger poker rooms to enter the market. 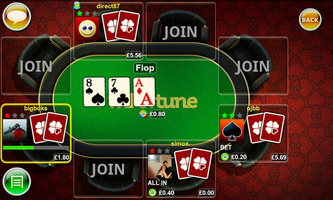 But mFortune haven’t done it the conventional way of starting up online and then switching to mobile poker. In fact they have done it in reverse by first opening up a mobile poker app and then releasing their PC based version of their poker room. The app is probably limited as to what it can offer in all honesty. There will be little chance of it ever competing with a PokerStars or a Full Tilt Poker but then again that’s not really what companies like this are all about. mFortune will be looking at providing an alternative to these powerhouses within the industry, so comparing the two won’t really be fair. We all know what not everyone will be looking to play on the biggest sites and some prefer the smaller more intimate affair of sites such as mFortune. 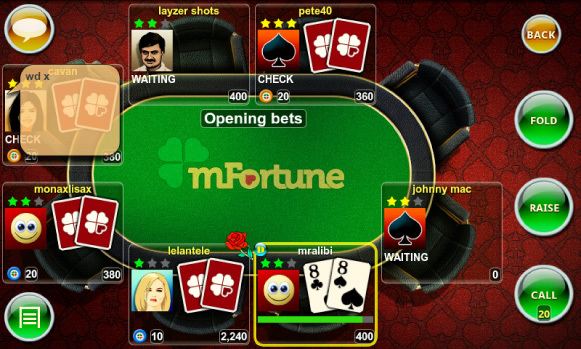 What needs to happen for someone like mFortune to be successful is offer a fun and exciting way to play poker via your iPad. Let’s face it, people aren’t going to be sitting down to play for hours upon hours on their iPad. They are going to be much more ‘smash and grab’ players, so the app has a very limited time to convert people. Let’s see how well they perform, without really comparing them to the bigger apps within the industry. As soon as you land on the home screen you will see that it’s a very well designed poker app and everything about looks really smart. The reds, yellows and darker shades of red really set it off, but we also like the ease in which you can navigate between the different options. The home page includes tabs for real money games, play money, banking, refer a friend and other games (note that this will take you off the app and to the mFortune homepage. Also on the homepage are three additional buttons including help & support, options and inbox. The inbox is the most interesting section of these three as includes a personalised message centre where you can contact support but also stay in touch with all the latest bonuses and promotions tagged to your account. As many of these offers are personalised depending on how much and what games you usually play, then this seems like an ideal place to keep in touch. The real money section is where you can get your first look at which games are on offer. Now before you get to see these you can select from three different options that include go to tables, play with friends and create private tables. The private table creation is brilliant if you want to play a game with some of your mates or even people you have met whilst playing at the tables. You can totally customise your table to be in any format supported on the app and simply set it away. We tried with a group from the office playing a sort of mini home game and had a great laugh in the process, although not much work was getting done! Once into the tables section you can see a list of all the cash games that are running along with how many players are at each table. One of the best features of the app – and something a lot of the bigger companies don’t do – is let you see exactly who is sat at each table before you sit down. The cash game tables range from 5 or 8 seaters and include stakes of 10c/20c, 50c/$1 and $2/$4. Whilst this is a good range, its lacking a few stakes in between as there is big jumps between all three levels. 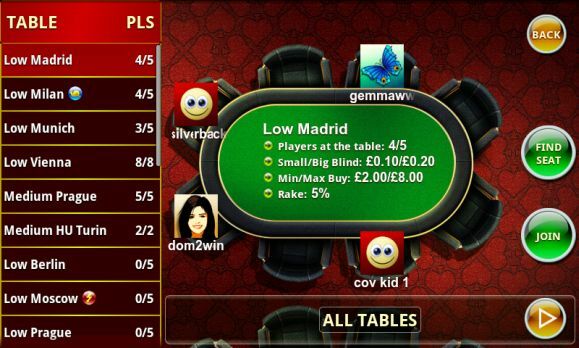 The Play for fun section is very similar to the cash game section allowing you to pick and choose your tables. It also gives you an overview of your play money chips so you can sit at the according tables. Unfortunately what’s missing from the app is any variation in mixed games such as Omaha. Having said that, Texas Holdem is going to meet the needs of the majority of players using this app, so it’s not a massive issue just yet! The tables look great! They are colourful, bright and just generally look like good fun. If anything, you could argue that they are a little cluttered and at times it’s hard to see the dealer and blinds buttons, but apart from that we are a fan of the mFortune table layout. One gripe within the app itself, but this magnifies even more at the tables, is how unresponsive the app can sometimes be. It often takes a good few taps (and firm at that) of the screen to make sure it knows what you want to do. Also the time it gives you to make a decision is pretty slim so make sure you are ready for the action falling on you, especially if you plan to raise! 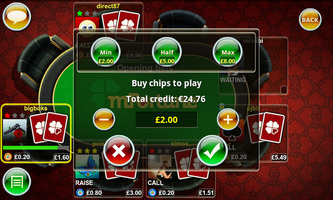 First up, new users to mFortune can get £5 completely free just for registering new account. This should automatically be credited to your account but they do state on their site that you may need to contact customer support if you have not received your free money within 24 hours. The second offer comes in the form of a more traditional 100% match on your first deposit between £3 and £100. The maximum you can claim for this bonus may be £100 but this is not the maximum you can deposit. Again the deposit should be credited to your account ‘within 10 minutes’ of opening your account, but we would recommend contact customer support before you start to play any games if you are looking to clear your bonus amount immediately. 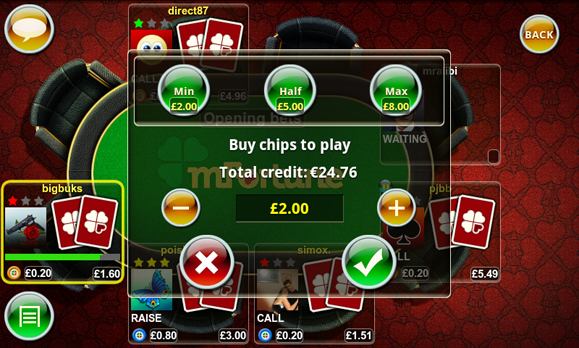 Overall there’s not a lot to dislike on the mFortune poker app. It’s probably best described as ‘good fun’ but everything about it just makes it so enjoyable to play poker on your iPad. It starts with the vibrant colour scheme and works right down to little things such as being able to change avatar and even send pointless gifts at the table. There are niggles in the app, no doubt about. The unresponsive nature of it gets a little frustrating, but we think these could pretty easily be ironed out. We said at the start of the review that we weren’t going to compare it to the bigger players in the market, but honestly it’s not that far behind. A really solid effort by mFortune on all accounts! We also recommend you try these other iOS poker apps.